I’m very happy that the official Kat action figure, which was based on her final scene in “Scar” and hit the shelves two years ago, turned out so exceptionally well. Still, I sometimes wish there were more Kat figures, modeled on other poses or scenes – such as the towel scene in “Final Cut” or one of her boxing moves in “Unfinished Business”. I used a Grindhouse Dakota figure with Lost Sun legs and a Kat head. 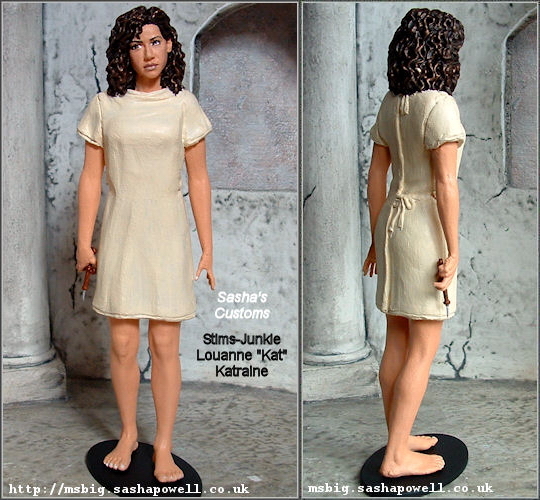 I sculpted her hospital gown and curly hair. I painted her to look more like Kat. She’s looking wan from her addiction. She has a syringe and a black stand with a peg to keep her steady. Sasha sold the figure on eBay, and I’m hoping it’s in good hands. “Stim Junkie Kat” is not the only figure she made, of course. You can view pictures of dozens of amazing, custom-made, unique figures – based on characters from Battlestar Galactica and many other productions – on her website. Some of the figures are currently for sale. Sasha also let me know that she takes commissions – so if you’d love to have a one-of-a-kind figure modeled on, say, “Captain Kat in Duty Blues”, this is your chance to make it happen. Speaking of alternate Kat figures: Erin Coplan from Propworx turned the official Kat figure into a very special Variant Kat. Also, another unpainted Kat figure popped up on eBay. This entry was posted in Other and tagged Action figure, Battlestar Galactica, eBay, Fan Art, Final Cut, Kat, Louanne Katraine, Merchandise, Propworx. Bookmark the permalink. Wow, I’ve only now seen your mention of my mod, done by Damaris of Propworx (she designs the catalogs!) thanks guys! I agree, there should have been more Kat, she was an amazing character, maybe we will see a Caprica action figure..